Jess Lanham’s solo show, Drifting Ruins, is an installation of works uncovering abstract landscapes of human relics and detritus. 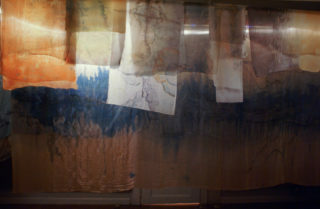 When viewed from multiple angles and illuminated by obscured light, a physical depth is exposed between glowing layers of suspended silk. The silk’s drifting sway mimics change and movement in time. The glow emulates a lifeform still present, urging viewers to explore the layers and discover what is left. Are we looking through a portal to the past, future, or another place entirely? Jess Lanham is an artist and designer based in San Francisco. Hailing from northern New Mexico, she attended the School of the Art Institute of Chicago and has exhibited in New Mexico, Chicago, and San Francisco. Jess is interested in how materials and artifacts collect and accumulate debris, and the new forms they assume over time. She explores the idea of objects either growing by themselves or being manipulated into something new and obscure. As these objects disintegrate and evolve, their moment in time becomes ambiguous, and their interaction with the landscape and atmosphere can blur the subtle distinctions between the old world and a potential new world.